TP Mazembe of DR Congo will travel to South Africa, West Africa to Guinea and Gabon as they seek to defend their Confederation Cup title. The five-time African champions have been drawn in a Group D alongside SuperSport United, Horoya and Mounana in the expanded group stage. Three-time winners CS Sfaxien of Tunisia will face South Africa’s Platinum Stars, debutants Mbabane Swallows of Swaziland and Mouloudia Alger from Algeria. 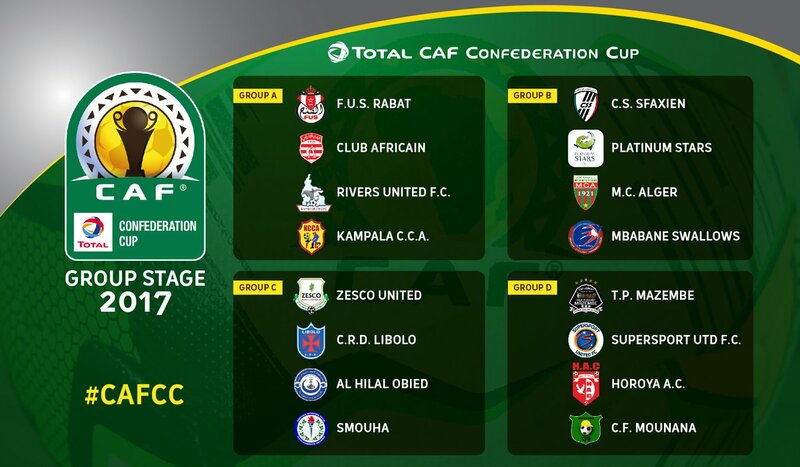 Moroccan side FUS Rabat, who won the tournament in 2010, face two sides making the debuts in the group stages in Rivers United of Nigeria and Uganda’s KCCA. The group is completed by Tunisia’s Club Africain, who were the winner’s in 1991 and runners-up in this competition 20 years later. The first group matches due to be played on the weekend of 12-14 May. The top two from each group will progress to the quarter-finals with the final set to be played over two legs in November.